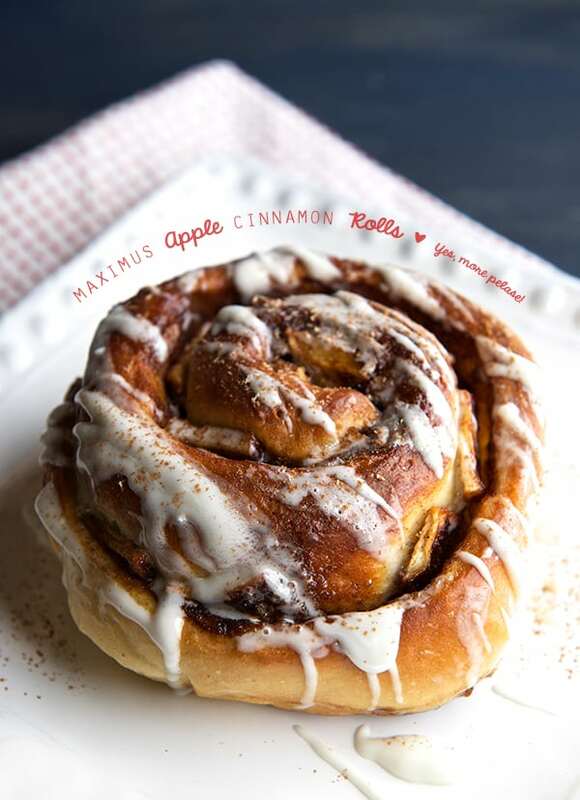 Maximus Apple Cinnamon Rolls with Eggnog Glaze ~ Yes, more please! 2 envelopes / 4.5 tsp / 14 g. active dry yeast or 1.5 ounces if using fresh yeast. 5-6 cups of unbleached all purpose flour. Plus a little more for dusting and rolling. *Butter and eggs should be room temperature for best results on a soft silky dough. 3 medium granny smith green apples, peeled and sliced in fine wedges. 1 cup packed brown sugar. Date sugar, coconut sugar, turbinado sugar are great substitutions. ¼ cup ground cinnamon. Use your favorite cinnamon. 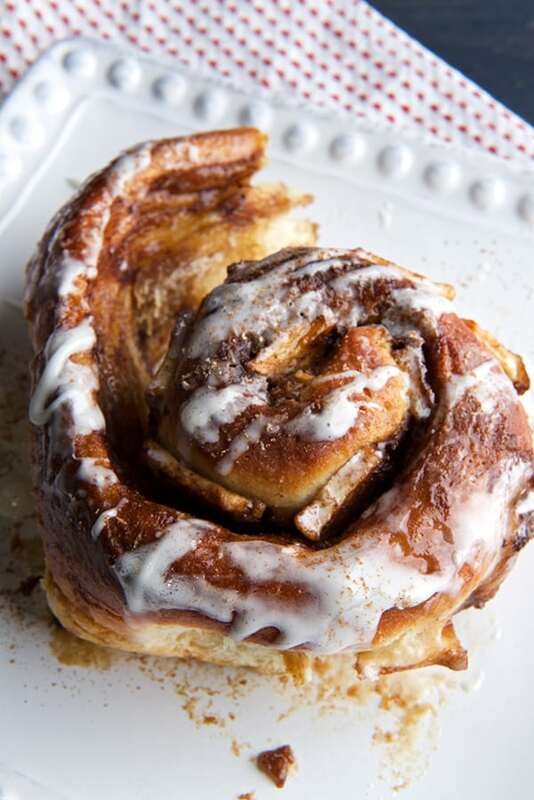 I love Saigon cinnamon for baking. It is so fragrant, flavorful and adds great color to your baking dough. Brown sugar: Raw coconut sugar if you prefer your buns less sweet.or Date sugar. Flour: You can substitute ½ the amount whole wheat and ½ white flour, and add 2 extra tablespoons of butter to the dough. Gluten Free: Use an all purpose gluten free mix, like “Cup 4”or “King’s Arthur gluten-free mix”. 1. 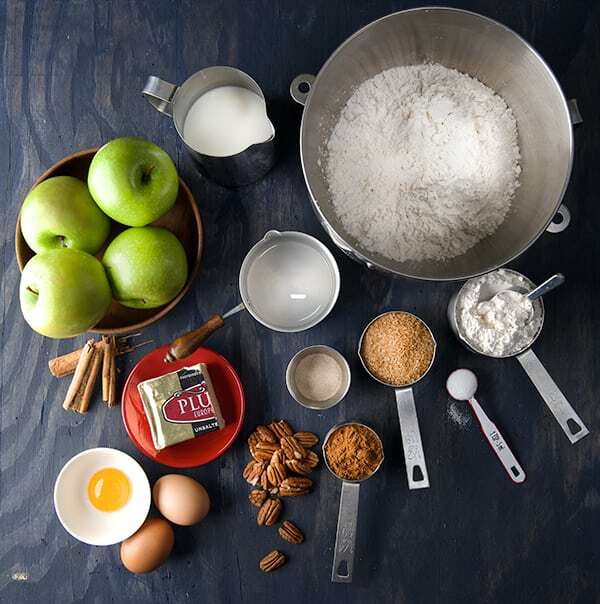 Start by measuring all your ingredients. 2. Start the yeast. In a small bowl combine luke warm water, dissolve honey and add the yeast. Mix and let it foam for about 5 minutes. 3. Using the bowl of your stand mixer, combine 5 1/2 cups of flour along with all the dry ingredients, whisk and then add the luke warm milk, butter, egg yolk and eggs. By now your yeast should be foamy and awaken, add to the bowl. Start mixing on low with the hook dough attachment. Scrape the sides until all is well combined. Increase the speed of your mixer until everything comes together and the dough starts to pull a side from the bowl. 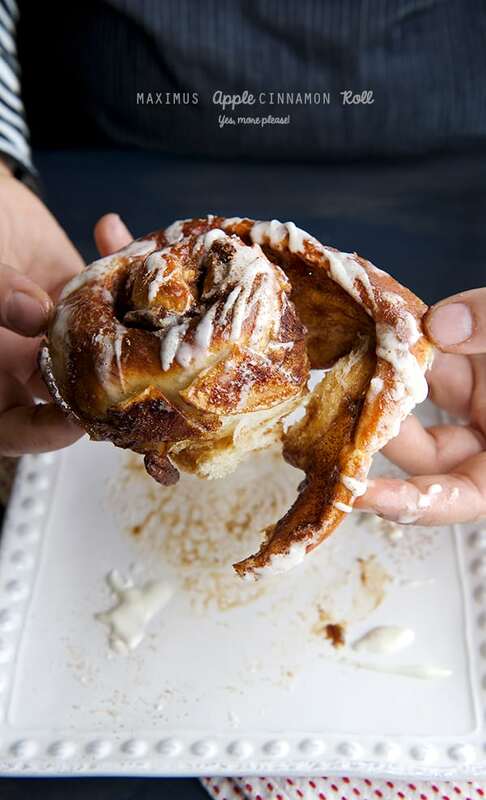 If the dough seems too wet, add one to two extra tablespoons at a time until your dough is not too sticky to the touch and its pulling apart from the sides of the mixing bowl. You can add up to 1/4 cup of flour not a bit more. Beat on medium high for about 5-7 minutes, scraping the side of the bowl now and then. See picture for best results. 4. Dust your work table with a bit of flour, dump the dough and finish kneading by hand using envelope movements. See picture below. For about 3 minutes or the equivalent of 10 envelope kneading. Your dough should be soft and tender, shape it into a ball. 5. Place the dough into a large, lightly greased bowl. Cover with plastic wrap and a clean kitchen towel. Place the bowl into a warm place about 80-85 degrees is best, away from any doors or window drafts. Let it rise until double in size, depending on the warmth of your house, could take between 1-2.5 hours. I usually place the bowl inside of my turn off oven to ensure the dough is rising at an even temperature. 6. Mix Brown sugar and cinnamon, toast the pecans, peel, cut and toss the apples in thin slices. And toss them into the cornstarch set a side. Melt the butter, get your pastry brush ready. 7. Once the dough has doubled in size, lightly flour your work table dump the dough and gently press it to release some of the air, and start shaping it into a rectangle. 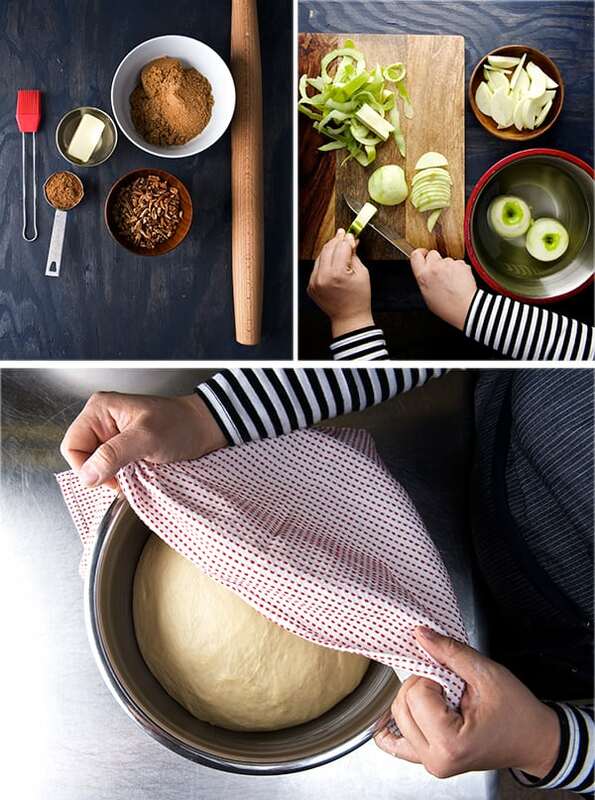 Using a wood pin roll gently start stretching the dough until you have a 20”x 16”rectangle. 50×60 cm approx. 8. With a pastry brush apply all the butter to the extended dough. 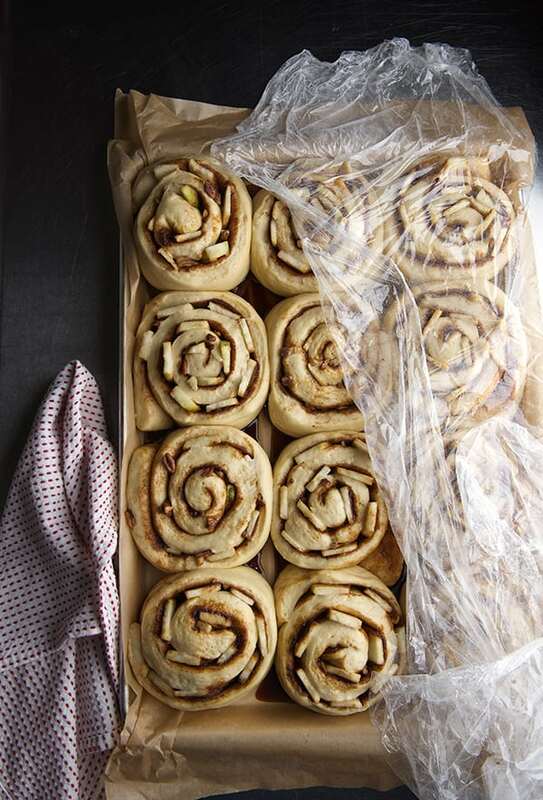 Then sprinkle the sugar, cinnamon and pecans mixture evenly and layer the apple slices like soldiers all lined up along the longest side of the rectangle dough. See picture below. This will ensure that the apple slices do not break or create holes into the dough while rolling. 9. Now from one of the corners of the longest edge of the rectangle, start rolling the edge by gently pinching it. This will be the center of the spiral. 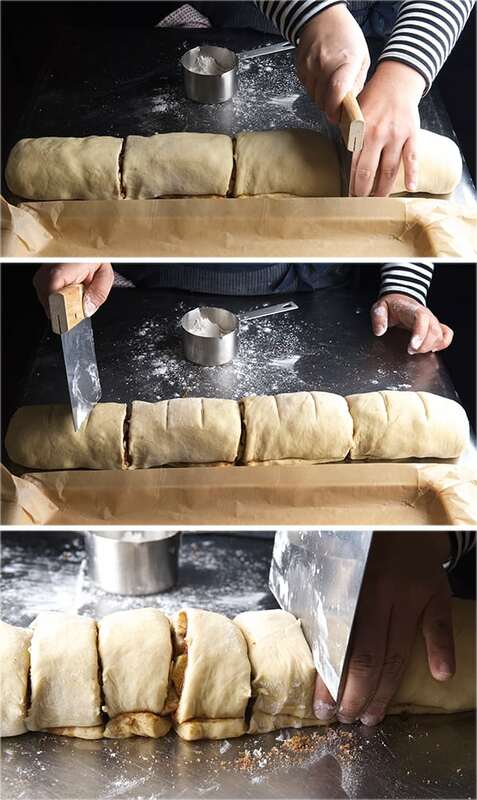 Start rolling evenly and slowly, not to tight, not to lose. And seal the edge with a bit of water. Leave the roll on the table seem side down. 10. With a bench dough scraper cut the roll in half. Use your hand to held the roll while you cut so the pieces do not smudge. See photo below. Then, each half into half. Now you have 4 pieces, cut each piece into 3 equal pieces. It helps to slightly mark the pieces before you cut them, in case you need to rectify the cut, so you can be sure you are gonna cut them into equal size rolls. See picture below. 11. Line up with parchment paper a half sheet baking tray with a leap 18”x13”x 1” or a half-sheet rectangular cake pan will work too. Or two rectangular trays 9” x 13”. Place the cut pieces carefully re-shaping them into circles and evenly spaced about 1” in between the edge of the tray and between roll and roll. If using half a sheet 3 rows of 4. If using two pans of 9”x13”, 2 rows of 3. Press gently to even up the heights. 12. 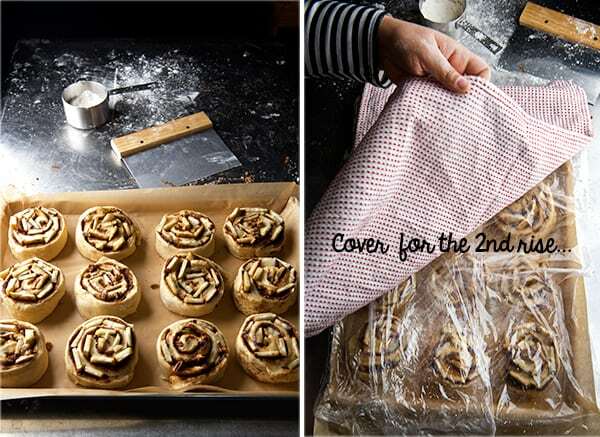 Cover them loosely with floured plastic wrap and then with a kitchen towel let them proof for about 45 minutes to 1 hour or until double in size and they are touching and filled up the tray. See picture below. 13. Once your Rolls look like this, preheat your oven at 375 F / 190 C. Place tray into the mid rack of the oven and bake them at 350 F /176 C, for 20-25 minutes. 14. 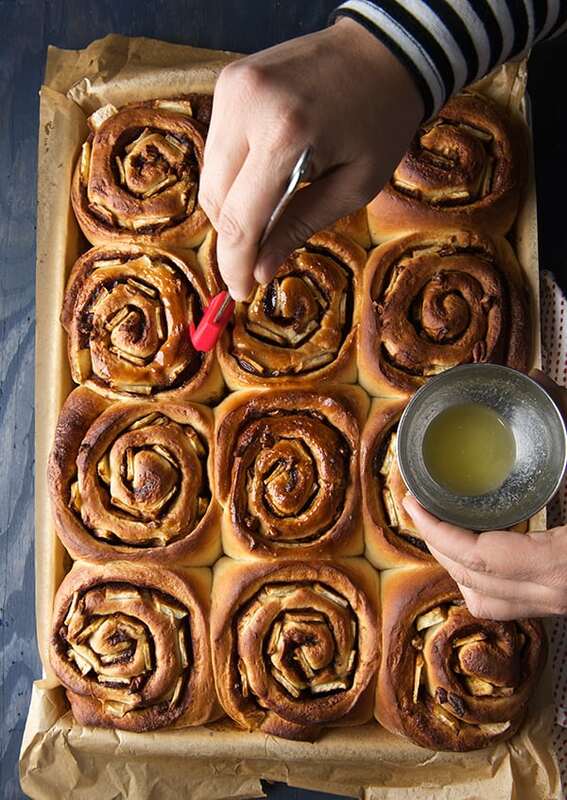 While they bake whisk up your glaze, combining all the glaze ingredients. You can up grade it with some Spiced Rum, for and adult situation. Softened cream cheese or mascarpone cheese is always a good option too. In this case I love the tangy sweet cream and creamy eggnog, with a bit of sugar in it , the nutmeg brings out the flavor of the apples. 15. Take the buns out of the oven, they should have a mahogany-golden brown tops. You can tell they are done if they spring back, insert a tooth pick that comes our clean in the center, and off course, if your kitchen has the insane smell of cinnamon sweet dough. Pull them out. Brush them with melted butter immediately. Let them rest on top of the stove, or near by the stove. Let them cool down a little before drizzling the glaze. Prepare the glaze by combining all Eggnog glaze ingredients and whisk until thick and creamy. 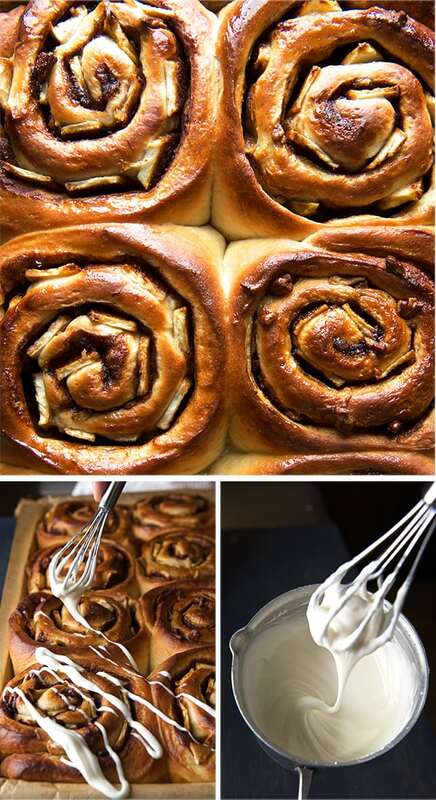 Drizzle with a spoon or the whisk. Grate some nutmeg for the final touch if you like. Now please, bite into one, and scream of happiness and Joy! Note: They taste best if they are baked the day before your Holiday. 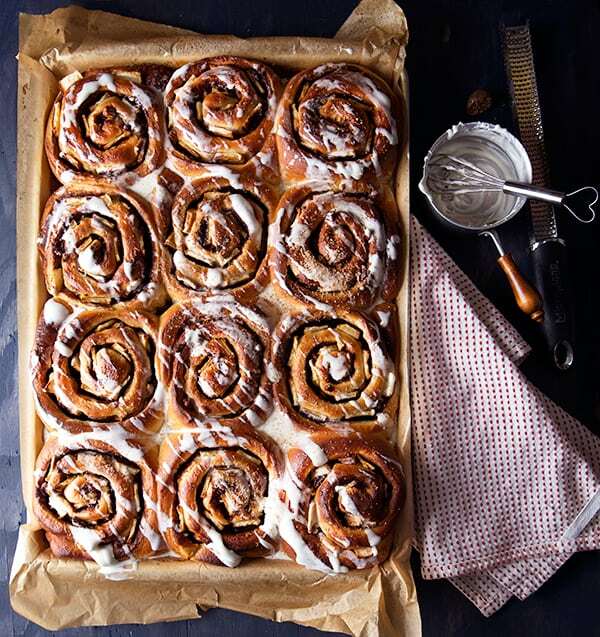 Save the drizzle and refrigerate them, warm them up next morning while opening the presents! Enjoy, and Happy , Happy Holidays!